According to many Utah clean-energy businesses, 2014 has been a landmark year. A fair number of bills that seek to address air and water quality and the use of electric vehicles and solar have made it far this session, though many have yet to be passed. 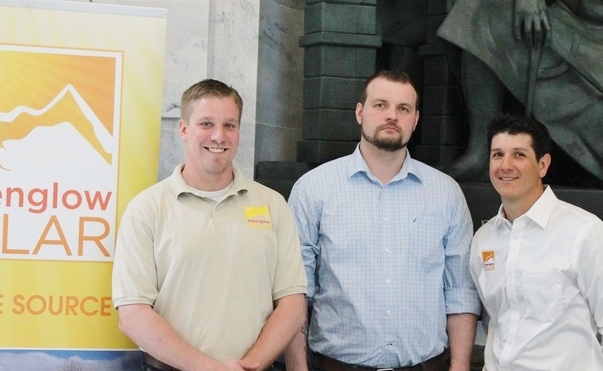 The first annual Clean Energy Business Day was held at the State Capitol on Monday was meant to showcase Utah’s growing "clean tech" sectors, and included businesses like Park City-based Alpenglow Solar. Patrick Fabian, who works in sales and marketing for Alpenglow, said the event was crucial to show how many Utahns support clean energy. "There are plenty of different technologies out there that can make our environment better," Fabian said. "We [installed] over 320 kilowatts of solar last year. It shows you how many people want [solar], they just need more information." Megan Nutting, director of policy and electricity markets for SolarCity, said one of the key bills this session is SB208s2, a net metering bill sponsored by Sen. Curtis Bramble (R-Provo). The first version of the bill would have required the Public Service Commission to impose a "reasonable fee" on utility customers who receive credit for energy they return to the electrical grid, claiming that solar users do not pay for the maintenance of the grid. "The assumption when it came out what that solar is bad and that it shifts costs onto other users. There’s no research on that," Nutting said. "There was a compromise for SB208s2, and it showed that a bill that originally could have harmed Utah’s nascent and fledgling solar industry was compromised and is something everyone can get behind." SB208s2 would allow the Public Service Commission to determine whether or not the utility company is adversely affected by those customers who net meter their energy. Thus, no outcome on the costs to the utility is assumed before a rate is charged or a credit is given. Nutting said Utah only has 2,000 household solar users, which is paltry compared to Colorado, which has 28,000, and California, which has hundreds of thousands. Thus, she said it would be unsound to "slap a tax" on these solar customers who do not represent a huge strain on the grid. Fabian said an important step the Legislature could take would be to mandate that all new construction have a certain amount of renewable energy built in. He added that installing solar panels is also easier if it is implemented into the design of new construction. "We need a law that says, ‘No new construction without a certain level of efficiency," Fabian said. Other bills of importance to those concerned about air quality include HB121, sponsored by Rep. Rebecca Edwards (R-North Salt Lake), which seeks to authorize the Utah Division of Air Quality to create emissions regulations that are more stringent than the U.S. Environmental Protection Agency’s standards. Despite being passed by the House, it was sent back to the Senate Rules Committee when it went to the Senate. Sarah Wright, executive director of Utah Clean Energy, also applauded HB19, sponsored by Rep. Patrice Arent (D-Millcreek), which would exempt businesses who provide vehicle battery charging stations from regulation as a public utility or corporation. That bill is waiting for signature from House Speaker Becky Lockhart after being passed by both houses. Another was HB74, sponsored by Rep. V. Lowry Snow (R-St. George), which would increase the tax credit an individual could receive with the purchase of certain energy efficient vehicles. That bill, like HB121, was passed by the House but sent to Rules Committee in the Senate. Despite some clean energy bills’ fates in the Legislature, Nutting said 2014 has been an "exciting legislative session" for solar energy. She encouraged lawmakers to continue to advance policies that encourage homeowners to pursue solar. "We all recognize in Utah that there’s plenty of sunshine to go around," Nutting said. "We just need to get the policies in place to get Utah homeowners the solar they deserve."